You might notice that this card is almost exactly like another card that I posted earlier this week. As I was making the version for the Make and Take I kept thinking that this card would be so much cuter (cuter is a word right? Well if it's not it is now!) in Pool Party. My favorite color is blue and has been leaning more towards shades of turquoise lately so it is really easy for me to reach for shades of blue when creating. It's my comfort zone, my warm snugly blanket in a way. Well for the Make and Take classes I really try hard to have samples with a wide variety of colors. Otherwise they would all have blue in them! So while I made the Make and Take card I also made this stepped up version in the color I was itching to use. Smoky Slate card stock 4-1/4" x 11", scored at 5-1/2"
Whisper White card stock 2-1/2" x 4-1/4"
Sweet Sorbet DSP 2-1/4" x 4-1/4"
Pool party card stock 2-3/4" x 3-1/4"
Whisper White card stock 2" x 3"
This card basically goes together the same as the Crisp Cantaloupe and Elegant Eggplant version, but if you didn't see that post or just feel like reading the instructions again... here they are! I started off by folding the Smoky Slate card stock on the score line. Them I stamped the flower image several times onto the top of the card front in Smoky Slate ink. To get the varied colors in the stamped images stamp it twice before adding more ink to the stamp. That gives you one darker image and one lighter image all with the same ink pad. Next use some good ole Glue Stick to glue the fabulous Sweet Sorbet DSP onto the large piece of Whisper White card stock, then onto the card front it goes with some more Glue Stick. Take the Silver Ribbon and cut a piece just long enough to wrap around the card. 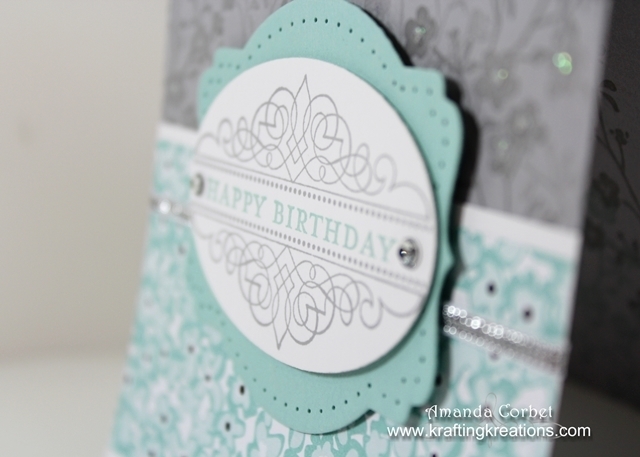 Use Glue Dots to stick the ribbon ends down in the center of the card. You won't have to worry about having neat cut ribbon ends or them meeting up perfectly because it will be covered by the label later. Take the small piece of Whisper White card stock and stamp the label image in Smoky Slate ink. Then stamp the greeting inside the label in Pool Party ink. Use the 2nd from smallest Ovals Framelit to cut out the stamped image. Use the 2nd from smallest Deco Labels Framelit to cut a label from the Pool Party card stock. Now Stampin' Up! really should come out with a piercing template that matches the Deco Labels! I used a combination of my other piercing templates to get close and just free handed the rest. Sorry, I don't have any more detailed instructions than that. Use some Stampin' Dimensionals to glue the stamped label inside the Pool Party label. Add some sparkle to the greeting with a small Rhinestone Basic Jewel on each side. 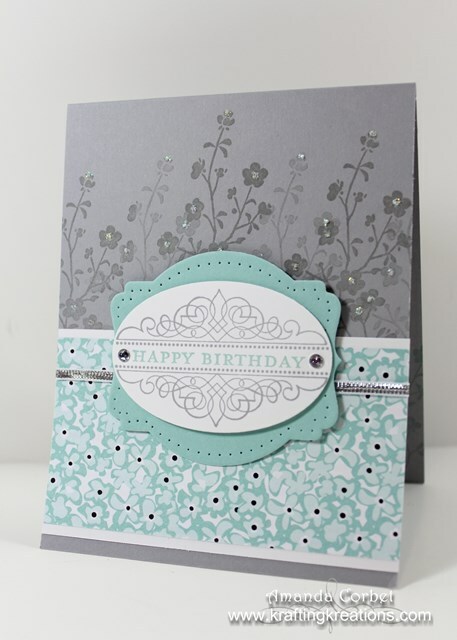 Then stick the label down onto the center of the card front with a few Stampin' Dimensionals. 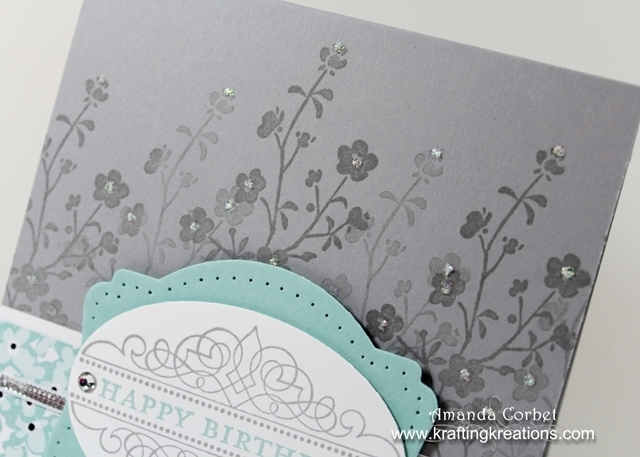 For some more added sparkle add a dot of Dazzling Details into the center of the flowers. You're done! A cute and lovely Pool Party birthday card ready and waiting to be sent to someone special! Someone special who loves blue... or turquoise... or Pool Party!